Presenting The Mortal Instruments #6 City of Heavenly Fire by Cassandra Clare. All good things come to an end. As such 'City of Heavenly Fire' marks the end of our beloved Mortal Instruments series. I know I am reading and reviewing it much later than I had anticipated (seeing as I bought the book last year) but somewhere in my mind I just knew I had to prolong it however long I could. So I re-read the books from 'City of Bones' to 'City of Lost Souls' before I finally dived into this 700 pages long tome and what a full-filling experience it was too..... And I wouldn't have it any other way. Cassandra Clare has clearly outdone herself. And while I despair at the height difference amongst my Mortal Instruments paperbacks. Seeing as the first 5 books are later editions and much more compact in size and City of Heavenly Fire being of more bigger font and big spacing. But at the end of it, what's inside matters and I wouldn't have it any different. It has everything an epic conclusion needs. Expertly tying the events from both the Clockwork Princess epilogue, to the events that transpired throughout the Mortal Instruments series. The perfect culmination of past, present and future. 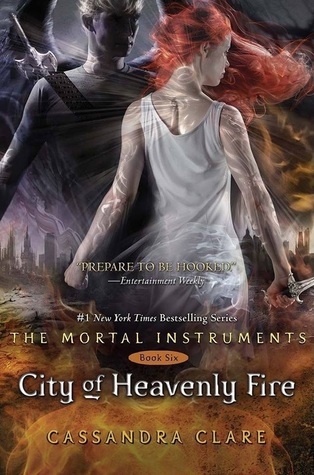 City of Heavenly Fire comes to us even more tenser and with much darker overtures than its predecessors. While comedy is in a bit of a shorter supply here pretty much all the characters find the time to show their wits and throw down sarcastic one-liners when the moment calls it. Even Alec jokes here and that's saying something. Be it Jace, Clary, Alec, Isabelle, Simon, Magnus, or any of the other characters we come across throughout this series. As I already stated they all get their moment to shine through. None of them are left out and none of them are spared. Everyone of them have come a long way from what they were at first and carry the plot forward in their innumerable swagger and strength. And Clare manages keep the manuscript well balanced heady with details and descriptions and still find time to introduce us to new characters that bring their own importance to the plot. As expected of the genre, there is action aplenty. This is a war that radiates its own darkness and while we pray for the safety of all of the characters we have ever come across in this expansive Shadow world, the casualties are many. Some more important to us than others, making us tear up at the cruelty of it all. War breeds victims, but war breeds heroes too. As Clary and the motley crew of the Shadowhunters and Vampire dare to end the untraceable demon realm to bring their loves ones back and take the fight to Sebastian without any thoughts of self-preservation. Amidst action and tension, there is redemption too. The author's true mettle is portrayed when he/she can nor only make us like/dislike these characters but also turn the tables on them and make us sympathize with the most hated of them all as well. Jonathan Morgenstern was a dream, someone that never really got the chance to live before Sebastian took hold. I and i'm sure lots of others out there may never forgive him for what he did but ...... he was guilty in the end and made us wonder about a life that never got to see the light and stayed with the realm of dreams. Cassandra Clare definitely deserves a shout out for such levels of dimensional-ity, she blew into her characters. That said, while i am sad to see the end of this series but also excited to begin the next series of this immersive world, The Dark Artifices with a fresh set of characters and the tv adaption of the mortal instruments series, called Shadowhunter. "A electrifying and rip-roaring conclusion"